The shortlist of six novels was announced last night at the LSE by Rudrangshu Mukherjee, chair of the DSC Prize 2018 jury panel, who along with the other four jury members, Claire Armitstead, Nandana Sen, Firdous Azim and Tissa Jayatilaka, had met a day earlier to choose the shortlist. Jury chair Rudrangshu Mukherjee said: "Being the chair of the jury of the DSC Prize has been one of the most enriching experiences of my life. I say this for two reasons. One is the sheer intellectual excitement of reading, evaluating and discussing these works of fiction. The other is the interactions I had with my four colleagues on the jury. I know I learnt an enormous amount from all of them and for this I am profoundly grateful to all of them. Evaluating these books reminded me once again of the importance of reading in human lives." Founded in 2010 by Surina Narula and Manhad Narula, this year the prize received a record 88 entries. Surina Narula said: "My heartfelt thanks and commendations to the jury panel for the detailed deliberations over the last few months, and coming up with such a good shortlist. The longlist announced last month was an impressive list; it must have been a challenging task for the jury to bring this down to a shortlist of six books. 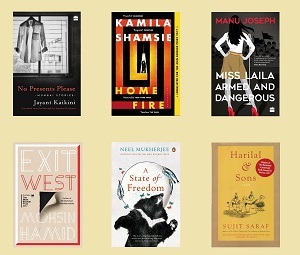 The shortlist represents the very best of South Asian fiction writing, and the depth, creativity and unique narrative of each of these novels is indeed both impressive and inspirational. My congratulations to each one of the shortlisted authors and translator and I wish them the very best for the final award ceremony." This year the prize received close to a quarter of the submissions from publishers based beyond South Asia and from countries such as the UK, USA, Canada, Australia. The jury will convene to select the winning author, ahead of the final award ceremony to be held at the Tata Steel Kolkata Literary Meet running in Kolkata, India 22-27 January.